From handguns to long guns, covering tactics and competition and everything in-between — enter the new world of popular series Handguns & Defensive Weapons, debuting on Sportsman Channel Monday nights beginning June 30 at 9 p.m. ET/PT. 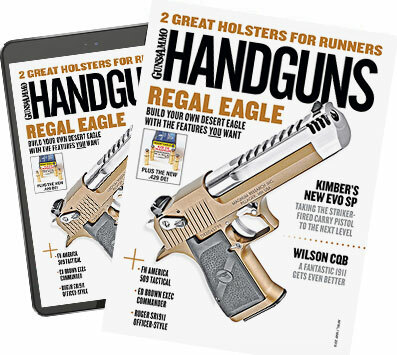 Filmed across the country at amazing venues, such as the world-famous Gunsite Academy in Arizona, Handguns & Defensive Weapons is co-hosted by Richard Nance and James Tarr — two names familiar to anyone who reads Handguns magazine. Every show features both a main handgun and long gun segment, covering everything from the basics of grip, stance, weapon manipulation, and shooting from field positions to competition tricks and advanced tactical techniques. The latest guns and gear are reviewed on the show and field-tested for the viewers, and in every episode the hosts offer a tip to improve shooting. Handguns magazine's own Dave Spaulding, a nationally recognized trainer, is only one of several guests appearing regularly on the show. "This is an entertaining show about handguns that Richard and I have fun with — even the credits are laughable as we roll bloopers from each episode," said Jim Tarr, host. "We can't wait for our die-hard Handguns fans to catch this new series." It's always better to go out with a bang. Every episode concludes with a competition segment, where the hosts take on each other and their guests for bragging rights. There are no retakes allowed in these competitions: What airs on TV is what happened, and of course a little trash-talking comes out when the scores are added up. In the premiere episode, the hosts bring out the big guns and practice shooting rifles from real field positions along Gunsite's famous Military Crest course. Jim Tarr's children stop by for a segment about kids, guns, and safety and then the new Nighthawk Custom 870 gets worked hard by Jessica Nyberg. Also, the hosts go head to head on the most famous pistol skills drill of all, the El Presidente&apos;•and then argue about who has the better excuses. Handguns & Defensive Weapons: Serious. Fun. Richard Nance is a veteran police officer, firearms instructor, defensive tactics instructor, and former SWAT team leader. He is the co-owner of WARTAC, a company that provides training in firearms, tactics, and personal defense. Richard writes for Guns & Ammo and Handguns magazines, as well as the InterMedia Outdoors Special Interest Publications division. A former police officer, James Tarr worked for 17 years as a private investigator in an around Detroit, but states that the most dangerous thing he ever did was drive an armored car around Detroit in his youth for the princely sum of $8.49 an hour. An avid competition shooter, Tarr is a Grand Master in USPSA and also competes in IDPA and 3-gun matches. He is a regular contributor to many national gun magazines including Guns & Ammo, Shotgun News, and Handguns Magazine. Tarr is also the author of several books including "Carnivore," Dillard Johnson's war memoir put out last year by Harper Collins. Handguns & Defensive Weapons airs exclusively on Sportsman Channel on Mondays at 9 p.m. ET/PT.